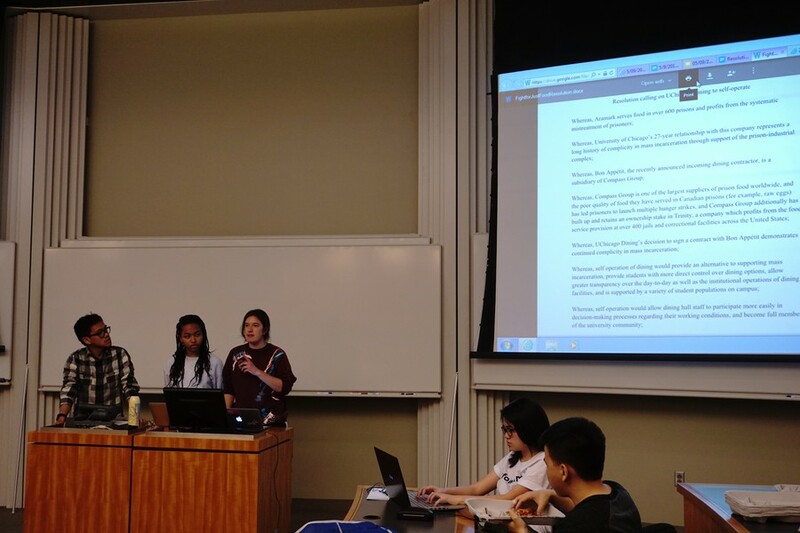 The Student Government Assembly discusses a proposal that the University self-operate for dining on May 9. Last night, the Student Government (SG) General Assembly rejected a resolution calling on UChicago Dining to transition to providing dining services in-house instead of contracting them out, which the resolution’s advocates argue would reduce the University’s financial support of mass incarceration. After a short discussion, a motion to reject the resolution calling for self-operation passed with 13 members voting yes, 11 no, and eight abstaining. The resolution was proposed by The Fight for Just Food (FJF), a student group that argues that the University is complicit in criminal justice abuses because it contracts with food suppliers who profit from serving food in prisons. FJF recently held a hunger strike in protest of the University’s affiliation with these companies. Bon Appétit Management Company, the food service provider that the University recently announced will serve food in the dining halls next year, is owned by Compass Group, which also owns companies that provide food to prisons, though Bon Appétit itself does not. FJF argues that self-operation would give students more control over dining options, provide greater transparency, and allow dining hall employees more influence over their working conditions. According to FJF, eight of the top ten universities in U.S. News and World Report’s national university rankings self-operate their dining halls. The resolution also calls for UChicago Dining to supply 40 percent of the food provided campus-wide through locally owned businesses on the South Side. According to third-year and FJF member Natalie Naculich, FJF has been in contact with local companies and believes its proposal is feasible. Class of 2018 Representative Calvin Cottrell stated that the contracts with Aramark and Bon Appétit both included minimums of how much food UChicago Dining must source from South Side communities. Naculich responded that the “local sourcing” mandated in these contracts includes soda and ice, among other items, which she argued is insufficient. Richard Mason, executive director of UChicago Dining, has stated that it would take three to five years for the University to transition to self-operation. The resolution FJF presented resolves for SG to call upon Karen Warren Coleman, vice president for campus life and student services, and Mason to “implement the University’s transition to self-operated dining services within 3 years.” Class of 2016 Representative Mark Sands questioned whether transitioning in three years would be possible considering Mason’s statement. Graham School student Cesar Dominguez, SG director of finance, argued that breaking the contract with Bon Appétit would impose a significant cost on the University. “You’re going to impact a lot of students with additional costs…and in the end, we’re going to suffer,” Dominguez said.